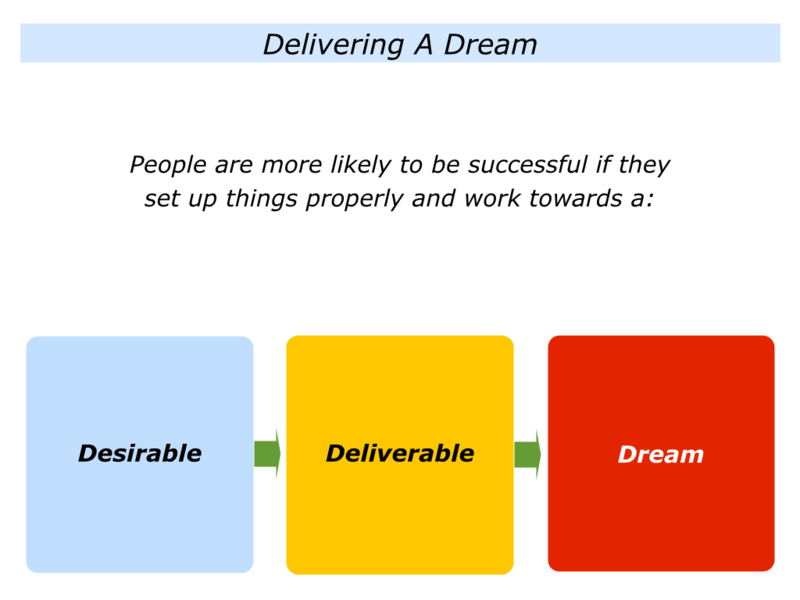 Looking back on your life, when have you focused on achieving a desirable and deliverable dream? You may have been aiming to climb a mountain, get a job, publish a book, complete a project or whatever. What motivated you to embark on the venture? What made it desirable? How did you do your due diligence? How did you prepare properly? How did you clarify the strategies to follow to give yourself the greatest chance of success? How did you plan to deal with any challenges? How did you get the support to do the job? How did you perform good work? How did you encourage yourself on the journey? How did you manage any setbacks? How did you do your best to deliver the dream? Describe a specific situation in the past when you set up things properly and worked successfully to deliver a dream. Describe the specific things you did to follow these steps. 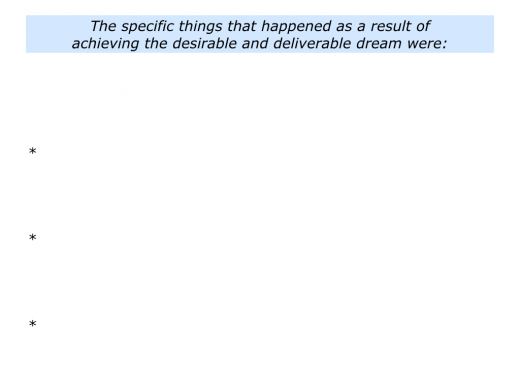 Describe the specific things that happened as a result of delivering the dream. Good workers do lots of research before pursuing a dream. They take this step whether working as individuals or as leaders. Let’s explore one approach to doing such due diligence. Imagine you have applied for a leader’s role. You will certainly aim to impress at the interview, but it is also vital to ensure the project has a good chance of success. Here are some steps you can take to make this happen. Start by doing your homework before the first interview. Gather all the information necessary to rate the team’s chances of success. It will be important to do the following things. Clarify who will be the key sponsors. Identify the people who can hire or fire you. These include the key sponsors, such as your manager, their boss and maybe other people. Clarify the sponsors’ picture of success. Put yourself in their shoes. Imagine what they must deliver in terms of the 3 Ps: profitability, product quality – including service quality – and people. Bearing these targets in mind, clarify what they will want your team to deliver. You will by judged by whether or not you reach these targets. Identify what you can and can’t control when leading the team. Clarify the resources you will need to ensure the team reaches its goals. Clarify the team’s chances of success. Bearing in mind the answers to the previous questions, rate the team’s chances of success. Do this on a scale 0—10. If it is less than 7, forget it. If it is 7+, clarify what must be done to increase the chances to get closer to 10/10. Assuming you still want the role, let’s explore the next step. This is the actual interview with the key sponsors. The candidate really did their homework … They know the results to be delivered … They see the world from our point of view … They know how to make things work … They will deliver the goods … They will be a superb appointment. Make your plans for getting the desired response. It is then time for the formal interview. Is there anything else you want delivered? After establishing credibility, focus on clarity, contracting and concrete results. Double-check the sponsors’ picture of success. Make sure everybody agrees on what must be delivered and by when. Check the Dos and Don’ts for working with the sponsors. For example, the level to which they want to be kept informed. Reassure the sponsors by describing how you will get some early wins. Your aim is to get the sponsors across the emotional line where they really want to hire you. Once they get over this line, you can then make clear contracts about the authority and autonomy required to deliver the goods. Imagine that during your research you found the team needs improving. It consists of six positive people, two negative people and two people who swing between being positive and negative. You may then say something like the following to the key sponsors. I will deliver the results. This calls for having positive people who want to achieve the goals. I will give everybody the chance to make their best contribution to the team. If people choose not to be positive or professional, however, I will get people who want to do their best. At that point I will need your backing, but I will deliver the results. Conclude the interview by saying you will email them to summarise your understanding of the meeting and how, if given the chance, you will deliver success. Let’s imagine you get the role. It is then time to move to the next step. Get some early wins. Remember you are still on trial, so produce some quick successes. Keep close to your sponsors, keep them informed and show you are on top of the job. Clarify the tough decisions that must be taken and, where you have the autonomy to act, make these decisions. What if you don’t have sufficient autonomy or the sponsors break any agreed contracts? Set up a meeting with the sponsors. Reaffirm the agreed picture of success. Then calmly outline the possible strategies for going forward, together with the respective pluses and minuses. Get the authority needed to act. If you don’t get it, consider your future. Security is to have an alternative, so make sure you maintain your network and have other opportunities. The good news is that – providing you involve the sponsors in exploring the choices and consequences – they will often provide the required backing. Good leaders know they will be judged by their results. So they start by getting the foundations right. This calls for doing everything possible to set up the team to achieve success. Imagine that have done such due diligence. You will then be ready to gather your team together and share the dream. Different leaders use different terms when communicating the goals, but they often cover similar themes. Such a leader may say something like the following to their people. Good leaders then give people chance to reflect about whether they want to work towards achieving the dream. If so, they then make clear contracts with people about their contributions to achieving the picture of success. Let’s return to your life and work. Looking ahead, can you think of a dream you want to achieve? This could be in your personal or professional life. 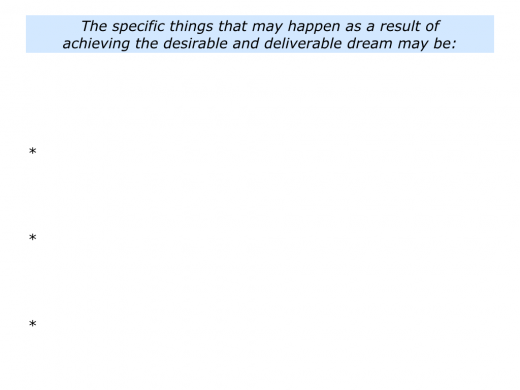 What will be the benefits of achieving the dream? How can you clarify and, if necessary, improve the chances of achieving success? How can you then do superb work and deliver the dream? Describe a specific situation in the future when you may want to set up things properly and work successfully to deliver a dream. Describe the specific things you can do to follow these steps. 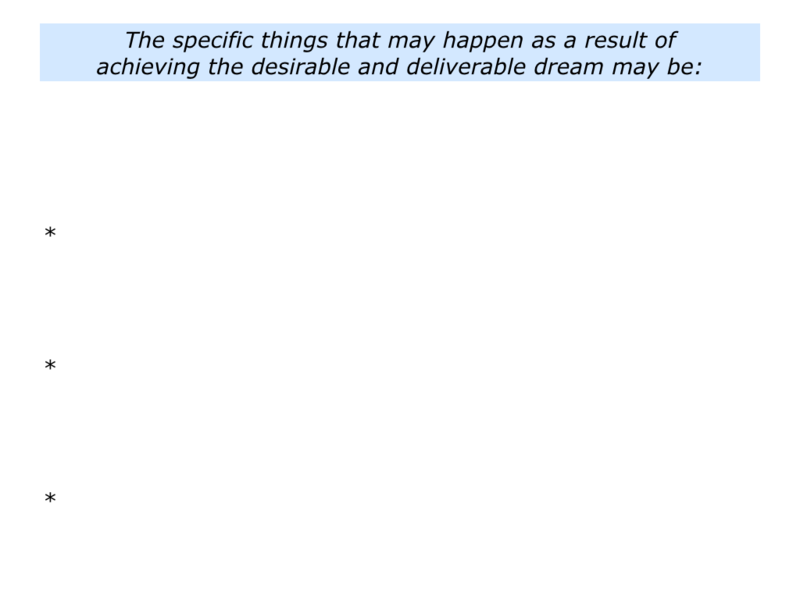 Describe the specific things that may happen as a result of delivering the dream.